The 1st Canadian Infantry Division and the 1st Canadian Armoured Brigade were selected for Operation “Husky,” the invasion of Sicily, when the Canadian government sought a role for Canada’s army in the Mediterranean campaign. After assault training in Scotland and re-equipment with the best available weapons and vehicles, the division sailed directly to the landing beaches near Pachino on the South Coast of the Island. Sicily was the Canadian Army’s first campaign and it is generally regarded a great success. Led by General Guy Simonds, who was to become the best-known Canadian General since Arthur Currie, the Canadians had the thankless task of attacking a well-organised withdrawal. Each piece of high ground, from low hills to mountain peaks was occupied and held by the German and Italian defenders until pressure or their timetable, forced a withdrawal. 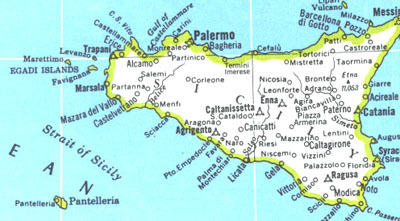 At the beginning of the campaign on July 10th 1943, Sicily was defended by the Italian Sixth Army with more than 200,000 men, supported by two German divisions. The landings on “Sugar” and “Roger” beaches were virtually unopposed. The first encounter with the German came at Grammichele, a seventeenth-century planned city built as a hexagon and perched on a long ridge. The crack of 88mm guns greeted the Three Rivers Tank Regiment and a fierce battle erupted. The Germans retreated after the Hastings and Prince Edward Regiment, the “Hasty Pees,” converged on the town with tanks and artillery support. Later in the campaign, the “Hasty Pees” carried one of the most spectacular exploits of the campaign. Carrying little except rifles and Bren guns, they scaled the mountain terraces leading to Assoro single file in partial moonlight. After a forty-minute climb on goat tracks they dug in on the edge of town, inflicting heavy casualties on the enemy when counterattacks were mounted. The Canadians then took Leonforte after a night of hard house-to-house fighting. Agira, where the Canadians suffered their heaviest loss of the campaign (438 casualties), was an even tougher problem and could not be captured until the Loyal Edmonton Regiment and the Seaforth Highlanders scaled the peaks over-looking the town. The Sicilian campaign made a significant contribution to the Allied war effort. 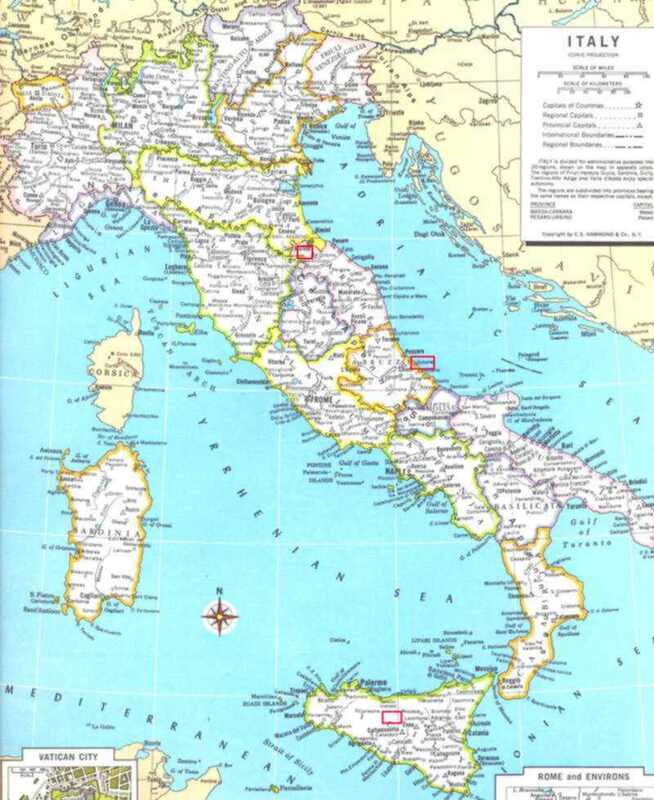 Mussolini was deposed at the beginning of the campaign, one of the major goals set for this offensive. The landings in Sicily were also an important factor in Hitler’s decision to end the offensive operations in Russia. Operation Husky was a strategic victory of great value. The Canadians in Sicily had lived up to their First World War reputation, fighting with skill and determination. The battle for the town of Ortona, a small port on Italy’s Adriatic coast, was just one part of a larger Allied offensive designed to secure the main East-West highway in Central Italy and outflank the German defences south of Rome. It is one of the best known battles fought by the Canadians in the Second World War: a battle of great innovation and adaptation in which the rifle companies had begun the operation at little better than half-strength. All the hardware of the infantrymen was brought to bear against this entrenched foe. Anti-tank shells could not blast through the thick walls so they were aimed through windows where they would ricochet, inflicting horrible damages. The Canadians entered the battle at Moro River and on the night of December 5/6, 1943, elements of three Canadian battalions were across the river. The terrain and weather were miserable with rain turning rivers into racing torrents and the ground into thick, clinging mud. Enemy counterattacks forced a withdrawal but the Hastings and Prince Edward Regiment raised in Eastern Ontario were able to re-establish a shallow bridgehead. On December 8, the Royal Canadian Regiment launched a new attack out of this bridgehead and together with the 48th Highlanders of Canada won control of the battlefield. The Canadians fought house by house for Ortona, which was given the nickname “Little Stalingrad” by radio journalist Matthew Halton. Canadian soldiers used a “mouse-holing” technique – blasting through walls and lobbing grenades to clear the staircases and upper floors. Here the Canadians wrote the book on street-fighting. Ortona was a victory for all of the Canadian troops – and all Canadians. Ordinary men, volunteering to leave civilian life behind because they were needed, had forged regimental extended families and small cohesive units that fought with skill and determination. Captain Paul Triquet of the Royal 22nd Regiment was awarded the Victoria Cross for his actions in Casa Berardi, a small town overlooking Ortona. After the fall of Rome in June 1944 the Germans withdrew to the Apennines to form a new defensive line, the Gothic Line. 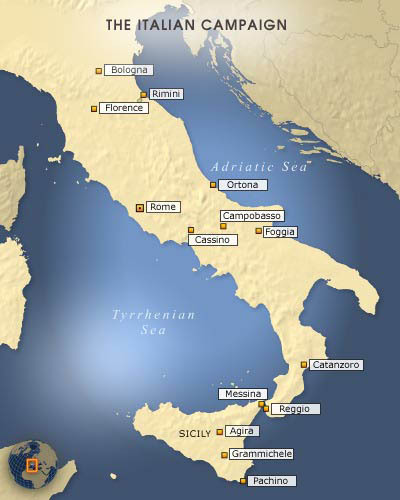 The Apennines is a range of mountains running the entire length of the Italian peninsula from La Spezia in the west to Pesaro on the Adriatic. Operation “Olive,” the Eight Army’s attack on the Gothic Line, was launched on August 24, 1944 and involved tens of thousands of men. The first days of September were proud moments for the 1st Canadian Corps. Men shrugged off fatigue, ignored the heat and endured the white dust, which lay “like powdered snow” three to four inches deep. It was impossible to see moving tanks, as they were enveloped in turbulent clouds of chalk; so were the men. But despite the chocking dust, thirst and danger, “the same old time-worn humour” perpetuated among the Canadian soldiers. Led by Major General Bert Hoffmeister, the Canadians had, by the afternoon of September 1, broken through the Gothic line on a mile wide front. But the hope of a quick major breakthrough soon faded. The assault on the Gothic line, which began with such promise, bogged down as enemy reinforcements arrived to man the new defensive lines. Continuous rain immobilized the tanks and limited air support. Artillery and mortars controlled the battlefield, and both sides had enough fire power to exact a high-price for each yard gained. There would be another winter of misery for soldier and civilian alike. The offensive on the Gothic Line forced the Germans to keep twenty-three divisions fighting in Italy, while the Allies built a firm bridgehead in Normandy. This was the strategy that underlay and justified the Italian Campaign. The troops who served in Italy made a vital contribution to the defeat of Hitler’s Reich.